Dark roast; a secret blend including Costa Rican, Colombian, Sumatran and French-roasted Guatemalan coffees. A rich, robust coffee with a smooth finish. Bold, never bitter, and available in decaf. Dark roast; A blend of French roasted Guatemalan, Sumatran, and Brazilian coffees, perfectly balanced with lower altitude robusta beans to deliver a full, smooth body and rich crema. Semi-sweet with notes of butterscotch and honey. Also available in decaf. City roast; A blend of Sumatran Mandheling, Costa Rica Tarrazu, and Tanzania Peaberry coffees roasted to bring out a clean and fruity acidity, a thick body, and rustic flavors. Citrus and black currant soften toward chocolate, carrying into a deep, sweet, rich finish. City roast; A blend of Costa Rica Tarrazu, Ethiopia Yirgacheffe, and Colombian coffees. A silky and balanced cup with plenty of fruit notes on the nose. Tastes of caramelized sugar and lemon, the Western Reserve Blend has a clean and slightly dry finish. City roast; full-bodied, highly acidic with a nutty flavor and lively aroma. Due to unique soil chemistry, coffees from Costa Rica have 15 – 30% more caffeine than other coffees. City roast; Very similar to Costa Rica: Balanced and full-bodied, but with a pronounced lower toned acidity, more reminiscent of apricot than lemon. A clean, long finish. This coffee is certified Fairtrade and Organic by OCIA. City roast; a medium-bodied, very clean coffee with acidity reminiscent of dry white wines, Custapec has a hint of nuttiness followed by a slight woodiness in the finish. This medium roast coffee has reached the second crack in the roasting process. The Antigua region is considered the finest growing region in Guatemala. The soil, climate, and altitude all work together to produce a wonderfully distinctive coffee. Its delicate, fruity flavor is laced with a spiced smokiness. 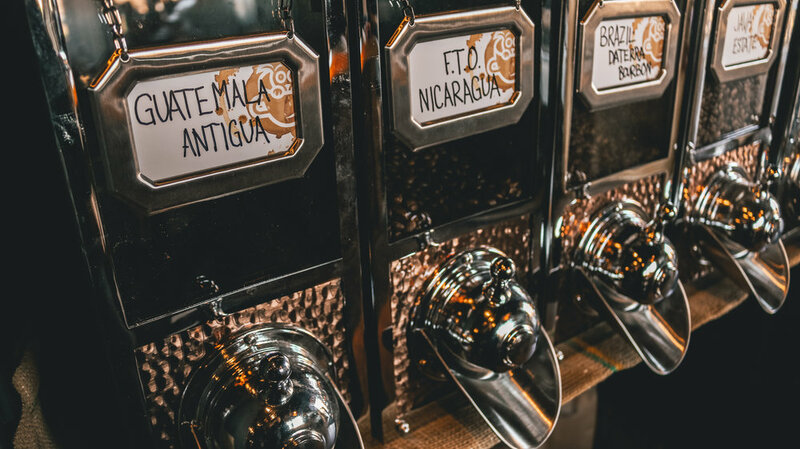 Antigua has a sharp acidity that dominates but is balanced with a soft, mild flavor and a light but sweet body. Fairly earthy and clean with a medium finish. The Guatemalan bean is available in both Italian and French roast, as well as a certified FTO Swiss Water Press decaf French Roast. The darkest of the dark roast, these beans are dark brown-black and covered with oil. The coffee has a very heavy, distinctive body with a bittersweet caramelized aftertaste. The middle color range of the dark roasts, the bean is dark brown in color and covered with oil. It has a smoked, spicy, sweet caramelized taste with a heavy body. The roast characters dominate the flavor, very bold with hints of dark berries. Smooth and medium bodied with a clean finish. Certified Fairtrade and Organic by OCIA and naturally decaffeinated using the Swiss Water Process. City roast; full body, delicate, but bright acidity and a smooth winey flavor. “AA” denotes the largest grade of bean grown in Africa. Considered by many to be one of the world’s best coffees. City roast; Tanzanian Peaberry is grown on the slopes of Mt. Kilimanjaro near the Kenyan border, and has some of the same characteristics as Kenya coffee, though lighter in acidity. Tanzanian Peaberry has a clean, nutty aftertaste. City roast; this coffee is grown in the southeastern region of Ethiopia. It is considered by many to be the finest Ethiopian coffee. This intense coffee has a unique floral bouquet with a hint of perfumed, sweet lemon peel. This washed coffee has good acidity with a clean bold cup quality. The lightest of the dark roasts, the beans are brown to light dark brown with a slight amount of oil showing. This bean has a deep body with a nutty flavor and a trace of bitterness that dissolves into a prolonged, sweet aftertaste. Java is an island in the Pacific near Sumatra. “Estate” indicates this coffee is grown at one of four government-owned estates, which yields a better coffee due to more strict grading standards than non-government estates. Lighter body, very smooth with little acidity and hints of spice. Herb-like qualities with a semi-dry finish. Blending yellow and red Bourbon to make a coffee that nature has yet to produce. Yellow Bourbon is native to Brazil and it spontaneously mutated from the Red Bourbon. Peanutty with spicy and earthy notes with a fairly heavy body. Low acidity and very complex, with a dry, white wine-like finish. City roast; This coffee is grown in the southern part of the state of Minas Gerais, the area that produces the “Best of Brazil”. The cup is medium-bodied and it bears a subtle sweetness in its full flavor. This is an excellent blending coffee enhancing all other coffees married to it, bringing out their best qualities while masking undesirable ones. City roast; described as the largest and most evenly graded Colombian coffee. It is known for being extremely aromatic with a rich, well-balanced cup. What is a single-origin coffee and why should I care? Single-origin coffee is made with beans that are from one single location, unlike a blend of different roast levels, geographic regions, and other factors. Single-origins are pure beans that come from the same harvest and roast batch, creating an extremely unique flavor profile. What is the Swiss Water Process? In this process, the coffee beans are soaked in caffeine-free green coffee extract (coffee flavored, but non-caffeinated) so that the caffeine is extracted from the bean and into the water yet the flavor components remain. The now caffeine-saturated green coffee extract is then processed through activated charcoal filters, sized correctly to remove the caffeine molecules and NOT flavor molecules, thus becoming caffeine free again and ready to extract caffeine from a new batch of coffee. The coffee beans are then dried to their originating moisture level and re-bagged. The Swiss Water Process results in coffee that is 99.9% caffeine free. What is a City Roast? City Roasts are the most consumed in the United States, and are intended to be the most you roast a bean before you begin to impart roast-based flavors. In other words, this is as dark as you can roast the coffee and still ONLY taste the origin itself. You will see minor color or oil differences (Colombia vs Brazil Santos for example,) these are intentional based on the origin and still within the standards of a City Roast, not to mention caused by as little as a 5 to 10 second difference in the roaster. Though normal coffee beans have two lobes, in approx. 3% of the beans one of the lobes will fail to develop, allowing the other to develop into a more round and compact shape, thus the name “Peaberry”. This oddity occurs in all varieties of coffee. Some believe that the smaller, more compact shape of the bean renders a flavor that is concentrated and more lively in the cup.